The villainous Dr. Hell has amassed an army of mechanical beasts in his secret hideaway, the island of Bardos located in the Aegean Sea. He is capable of controlling mechanized beasts with his cane, and instructs them to unleash devastating attacks. However, Dr. Hell doesn't do all the dirty work by himself; he has his loyal henchman Baron Ashura to carry out his devilish plans. There are also those that will see to it that evil does not prevail. Kouji Kabuto is the young and feisty teenager with a score to settle: his goal is avenging the murder of his grandfather by Dr. Hell. And he might just be able to pull it off, as he is the pilot of Mazinger Z, a mighty giant robot made out of an indestructible metal known as Super-Alloy Z.
Mazinger Z boasts several powerful special attacks. By channeling Photonic Energy through its eyes, and unleashing the Koushiryoku Beam, it can cause great destruction. But things get really cool when Mazinger Z launches its Rocket Punch attack. Dr. Hell and his minions might have just found their match! Alternative version: Mazinkaiser, Shin Mazinger Shougeki! Z-hen, Mazinger ZIP! 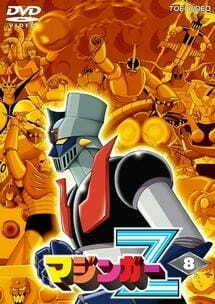 Mazinger Z is a classic of the mecha genre. This anime introduced many concepts which we see at any mecha anime, for example: The robot is the last hope of humanity, being piloted by a human (preferably teenagers), mad scientists trying to conquer the world, cronies incompetent or strange-looking people, a proud pilot woman (do you remember Asuka?). In each episode is the same plot: Dr. Hell sends his Mechanical Beasts, Koji Kabuto runs to Mazinger, background music resounds, and the battle begins. Many emotions and feelings are mixed in the battle, but in the end, Mazinger is the winner. I saw this anime in the 1980s as a kid and I still like it. If you like the mecha genre, you should see this anime. I know these words are not enough to describe it and see it as an adult is not the same when you were a child. This is my humble opinion. I hope you find it useful.